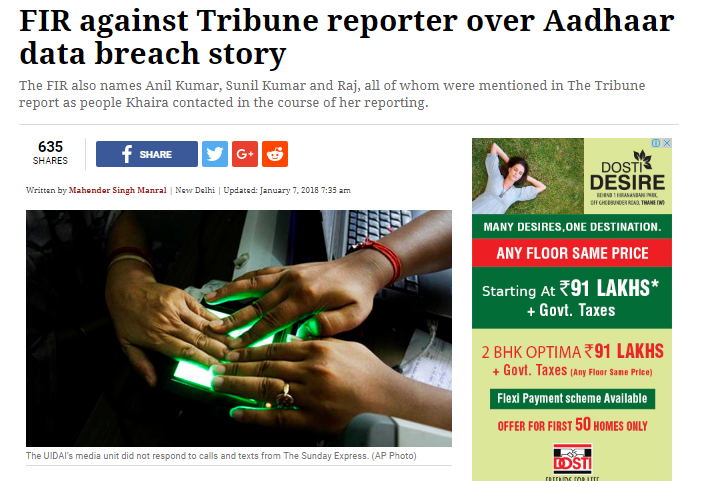 Instead of complimenting the reporter for showing how data breach is happening, the authorities decide to file FIR... meaning henceforth no one should tell UIDAI there is a problem with their systems. This is the way most governments typically deal with events like this... if the news is bad, shoot the messenger of the news. Very stupid... very immature. Funny thing is UIDAI is asking the reporter "how many Aadhaar numbers did the correspondent actually enter through the said login user id and password and whom did those Aadhaar numbers belong to"... why you need this info? Are you not maintaining access logs? Shocking! The letter asked for these details to be sent by January 8, “failing which it will be presumed that there was no access to any Fingerprints and/or Iris scan”. This means all other details (name, DOB, address, contact details etc) can be accessed and is NOT an issue.